For the most of my childhood, I used a communication board. My communication board was a menu with letters, words and phrases. I can tell you numerous stories where I was trying to tap out lengthy messages and I had to stop either because I was getting tired or I felt like the person reading the message wasn’t paying attention to what I was saying. I do use sign language, which I enjoy using, but not everyone knows it. I mainly spell everything because I can’t do most of the signs due to the cerebral palsy. My favorite way to communicate is with my augmentative communication device. Right now, I have an Accent, but with technology constantly changing, who knows what I will communicate with ten, fifteen years from now. The current Accent has pages of letters, numbers, words and phrases that I can use to type out messages. 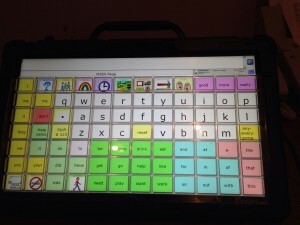 I highly prefer augmentative communication devices over a communication board because it allows for me to have a voice. I take it everywhere because nobody goes out without a voice and this is my voice.